What Does A Land Survey Reveal About Your Property? Once we selected our building site, we were provided with a plat of the area and a general layout of how the house will sit on the land. We walked the perimeter of the property many times and become very familiar with it before construction even began. Though many people don't care to take the time to become familiar with their land, they really do miss out on some of the “day dreaming” that makes building a home so exciting and rewarding. The Process of selecting the lot and home type took only a few days and required some paperwork and a deposit. Ryland was very flexible in working with us and very responsive to our questions and needs. Having a builder with these attributes makes the process much smoother and more enjoyable (or tolerable) as you will be making hundreds of decisions over the coming months that require their attention and response. 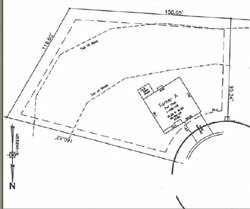 It is imperative that you have land surveyed before you purchase any real estate property. Many people forget the importance of the survey of land and the several steps that must be taken before the acquisition. In fact, the best time to hire the services of a land surveyor is before completing the transfer of title process. This way, you are given the assurance that the boundary as stated in the deed of sale is true. 1. Land surveyors are experts in their chosen field and they can tell you the exact limit of the property's measurements in accordance with what is stated in the title. In addition to this, the survey will also inform you of any structure which was built on the lot. 2. Encroachment is avoided if you have the entire property surveyed earlier. If you are trying to buy the land for home construction, it would be best to determine the area before starting your building project. 3. The land survey is also important for you to determine whether neighbors have encroached upon the property. You can never be sure whether your lot boundaries are true if you do not hire a surveyor to do the job. Meaning your neighbors shed, garage or favorite tree actually may be on your land. 4. The survey can also tell you whether the area is safe for building a home. You know that it is expensive to build a house and if you want to be sure that there will be no future problems regarding the location, it would be best to hire a land surveyor. There are various possibilities especially if you are buying a parcel of land that is located in a mountainous place. The possibility of water damage in your basement and soil erosion can happen in the future so a survey will help determine the proper location on your property best suited for building your home. 5. If the land is very wide and you have other purposes aside from building a home, the survey will be very helpful for your cause. There are certain regulations and limitation regarding the process of subdividing a real estate property. The land survey can assist you in determining whether your plans are feasible and legal. If you are thinking that the old or existing land survey will do, that would depend on how old the said document is. Many changes may have occurred in the area since the last survey and that would make the old survey unreliable. It may no longer be a good reference when it comes to recent renovations that have been made. Another advantage of having a land survey is that the surveyor will be placing permanent boundary marks on every corner of the property. This will help you take note of the boundaries so you can avoid encroachment. Some buyers make the common mistake of relying on the words of the real estate agent or even the owner of the property when it comes to the boundaries. This should not be the case. They may just tell you what you want to hear so you purchase the property. Then problems could arise at the bank closing, or sometime in the future when it is too late. Land is a precious asset and if you are serious in purchasing the property, you should be able to make sure of your boundaries. Always remember that once the deal has been signed, you are on your own. Simply put, any red flags that might be discovered during the land survey should be resolved before the sale is closed.